Harold R. Dryden, 94, of West Union, Ohio passed away Friday, September 7, 2018 at Greene Memorial Hospital in Xenia, Ohio. He was born April 7, 1924 in Manchester, Ohio. He was preceded in death by his parents, Darius and Margarette (Bradford) Dryden; wife, Jean (Malone) Dryden; sisters, Aleyne Chandler, Amelia Gulley and Helen Dryden, and brothers, Harmon Dryden and Junior Dryden. 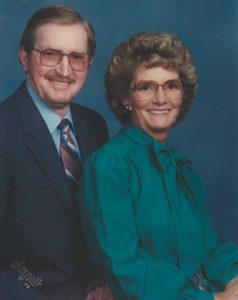 Harold is survived by his children, Larry Dryden of Xenia and Debbie Fisher of Cincinnati, Ohio; two sisters, June Vogler of Cherry Fork, Ohio and Marylin Myers of San Francisco, California; four grandchildren; nine great grandchildren, and many nieces and nephews. Harold retired as Superintendent with O.D.O.T. in West Union after 22 years of employment. He was a farmer, carpenter, and livestock dealer. He was a former Mayor of West Union. Harold was a member of the Dunkinsville United Methodist Church. He was a member of the Adams County Democrat Club, and former member of the Adams County Democrat Central Committee representing Tiffin East. The visitation is from 11 am until 1 pm on Tuesday, September 11, 2018 at Lafferty Funeral Home in West Union. The funeral is at 1 pm. Burial will be at Cherry Fork Cemetery in Cherry Fork. My deepest sympathy, tboughts and prayers go out to the family. I loved Harold like an uncle and my father, Herbert Leroy Dryden, loved him like a brother. Sending my biggest hugs out to you all. Sincerely, JoAnna (Dryden) Wells of Cincinnati, originally from Lick Skillet Road. We send our sincere sympathy to the family on the loss of Harold. Our prayers are with all of you. My thoughts and prayers go out to you and your family. He was a good man. Hugs and prayers. We are so very sorry for you’re loss. Harold was such a wonderfully kind man. We won’t be able to attend as we have our gsons that day. However, know you’re in our prayers and have our sympathies. My heart is sad,but precious memories will linger on. God bless. So sorry for your loss. Prayers for you Larry and Debbie as you prepare to say your good byes. Harold was a good man, always had a smile for me...was so glad to help care for him at the Manor. Sorry for your loss. He was a good man. I so sorry for your loss. Larry, Debbie and family. We are so very sorry for your loss. Uncle Harold’s and Aunt Jean’s we’re definitely a place everyone wanted to be. Such good memories of both of them. Everyone was always made welcome in their home and by them. May God Bless the family and May they both Rest In Peace, together again. © 2019, Lafferty Funeral Home, Inc.